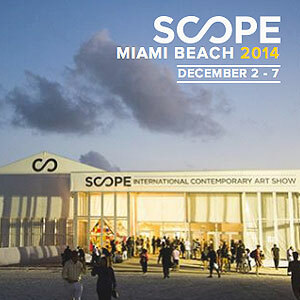 Celebrating its 14th year of introducing galleries to the contemporary market, SCOPE returns to its location on the sands of Miami Beach with 111 International Exhibitors from 27 countries and 48 cities. Long-established as the original incubator for emerging work, SCOPE’s Feature Programming will include and an exploration of the New Contemporary scene with ‘Juxtapoz Presents’. Located at Ocean Drive and 9th Street, SCOPE Miami Beach opens on Tuesday, December 2, with its exclusive Platinum VIP Brunch, VIP & Press First View, and to the general public December 3 – 7, 2014.